Reproductions of textiles originally covering the walls of the Raphael Room at the Isabella Stewart Gardner Museum have been installed to restore the gallery to its circa-1924 appearance. Over several decades, extensive work has gone into restoring the galleries of the Isabella Stewart Gardner Museum in Boston to their look at the time of Gardner’s death in 1924. The museum, built in the style of a 15th-century Venetian palace, opened in 1903 to house her extensive collection of paintings, sculptures, textiles, furniture and other items collected around the world and created over a 30-century span. Three floors of exhibition space in light-filled galleries are arranged around an interior courtyard garden. In the Raphael Room on the second floor, textiles covering the walls and upholstered furniture are a major part of the restoration, which is nearly complete. 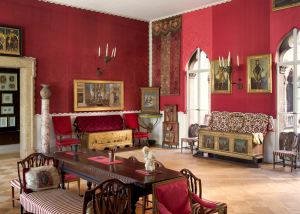 Gardner had collected a number of 17th- and 18th-century Italian and Spanish silk damask and velvet fabrics, and she used 18 damasks and two velvets to cover the walls in that room, piecing them together in a patchwork-like way. The original fabrics were replaced in the 1950s, and now, those newer fabrics, sagging and faded after 60 years, have been replaced with reproductions of the original fabrics. The Gardner archives had only a few original fabrics, so Tess Fredette, senior textile conservator at the museum, and her team researched 1926-era photographs of the room and archives from other museums. She then worked with a designer, weaving technician and others at commision silk weaver Prelle et Cie, Lyon, France, to execute the reproduction of each fabric. “I was able to sit with the woman who designed the patterns on the CAD system and talk to the weaver to decide what looms to use to weave the fabric, and decide how best to do that in a very cost-effective way,” she said. Founded in 1752 and now a fifth-generation family business, Prelle originally specialized in handwoven, custom damask, brocade and velvet fabrics. Today, it reproduces historic fabrics and weaves new high-end custom fabrics for interior and couturier applications, utilizing both hand looms and high-tech industrial looms. For the Raphael Room, Prelle set up two Dornier electronic looms with the two warps to weave all the damask patterns, and another loom to weave the velvets. In all, 300 yards of fabric were woven. In addition to the fabrics reproduced by Prelle, there are other fabrics that museum staff replicated in-house. Textile conservator Elsbeth Dijxhoorn re-created bands of linen embroidered with silk chenille emulating tasseled fringe to use on three velvet-covered stools in the room. The chenille was dyed to match the original colors found in a seam on the original bands. 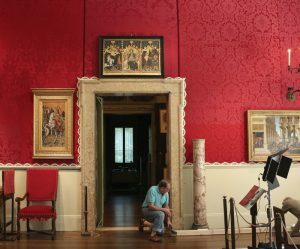 Before and after: In the Isabella Stewart Gardner Museum’s Raphael Room, so named because two paintings by the Italian Renaissance artist hang on its walls, the original damask fabrics hanging on the wall were replaced in the 1950s by newer fabrics, which are shown in the photo below. 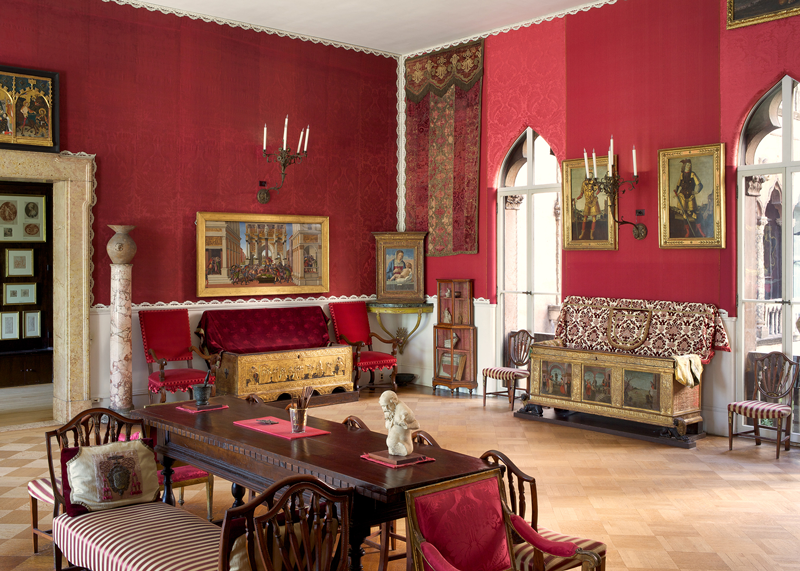 Those newer fabrics, sagging and faded after 60 years, have now been replaced by reproductions of the fabrics that were installed originally by Isabella Stewart Gardner, as shown in the photo above. Also, Fredette speculates that some of the original velvets on the walls had once had floral appliqués on them, but not when Gardner collected them. Where appliqués had fallen off, the tight stitching that had been used to attach them had left impressions on the fabric. “So to emulate the floral impressions left by missing appliqués, we had the new velvets embossed in-house,” Fredette said. The rubber embossing stamps were hand-carved by fiber artist Emma Welty. To replicate certain details on the walls and window trims, the museum commissioned six custom-produced silk trims from New York City-based Samuel & Sons and four handwoven silk chenille trims from Paris-based Passementerie Verrier. All of the fabrics are 100-percent silk, so to satisfy Boston’s fire codes, the museum lined the walls with Velos II flame-retardant Trevira CS polyester napped velour fabric produced by Création Baumann, Switzerland. The Velos II was hung upside down to take advantage of the nap angle as a means to hold the silk fabrics in place and mitigate their sagging over time. For more information about the textile restoration at the Isabella Stewart Gardner Museum, contact Sarah Whitling swhitling@isgm.org; gardnermuseum.org.